It’s Raining Black! 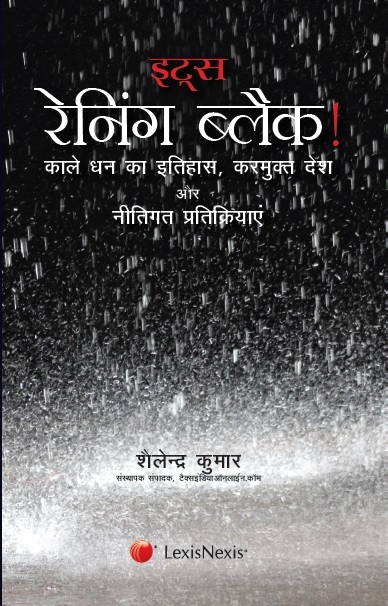 Chronicles of Black Money, Tax Havens & Policy Response (Hindi Translation) is a unique combination of legal and policy level developments. The book is spread over eight chapters dividing the analysis into two broad aspects, first, the domestic perspective and secondly, the international arena. The underlying theme of the book is that unless domestic generation of black money is curbed, our gallant efforts to retrieve wealth from tax havens would not meet with much success. The book attempts to provide an effective approach for the Government to combat the multiple aspects of black money in a comprehensive manner. This work is more than a legal treatise as it not only deals with the legal complexities of DTAAs and domestic legislation, but also makes an objective assessment of facts and events which have influenced the campaign against black money in the past few years.